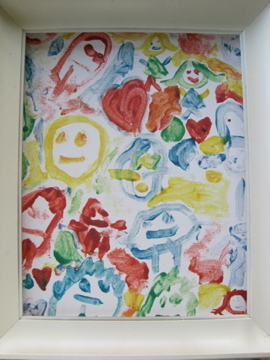 I'm back today with a few more ideas of things to do with children's artwork. Above is a painting my 3 did on a canvas when they were 5, 2 and 1. I think I might need to have it matted and framed. I love all the faces. Hannah painted this rooster in 2nd grade. I color copied it and mod podged it to the middle of a toile tray. 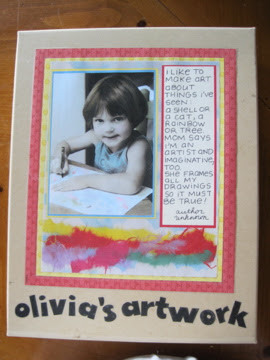 This is an art box I have for each of the girls. It is fun to dig through it and see all those treasures. I made these cards years ago with copied artwork. I remember giving them to grandmas for Christmas presents.